This exquisite drawing by the thirty-year old Edouard Manet is an initial study for his 1863 masterpiece Olympia. It must have been a very early idea because there are many differences: a leg is raised, the arm is fully bent and the torso is not twisted to face us. Nor do the head and shoulders appear to be those of Victorine Meurend, the final model. 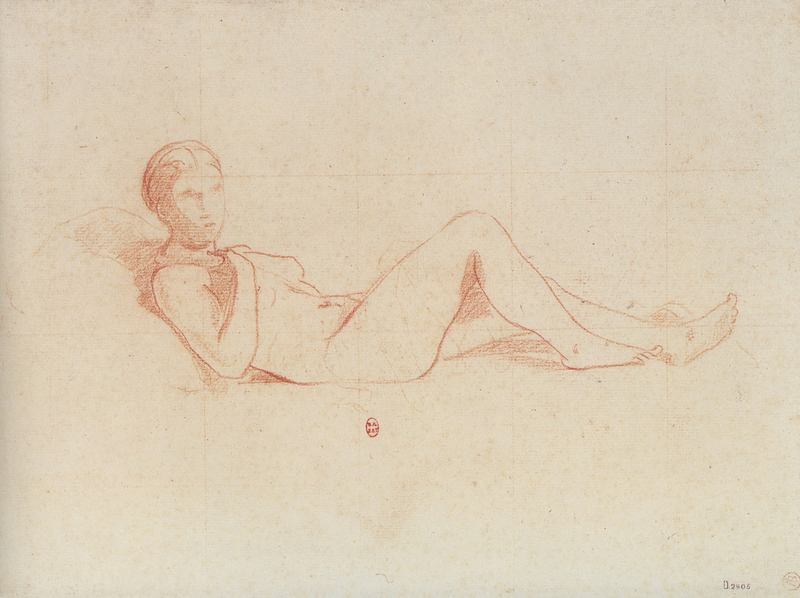 Manet, Study for Olympia (1862-3) Sanguine on paper. 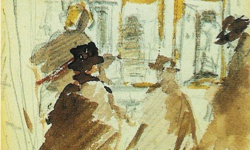 Bibliothèque Nationale de France, Paris, 22.5 x 30cm. 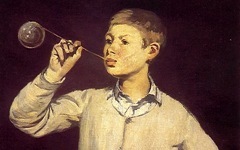 Nevertheless, Manet was already thinking of himself as the model. 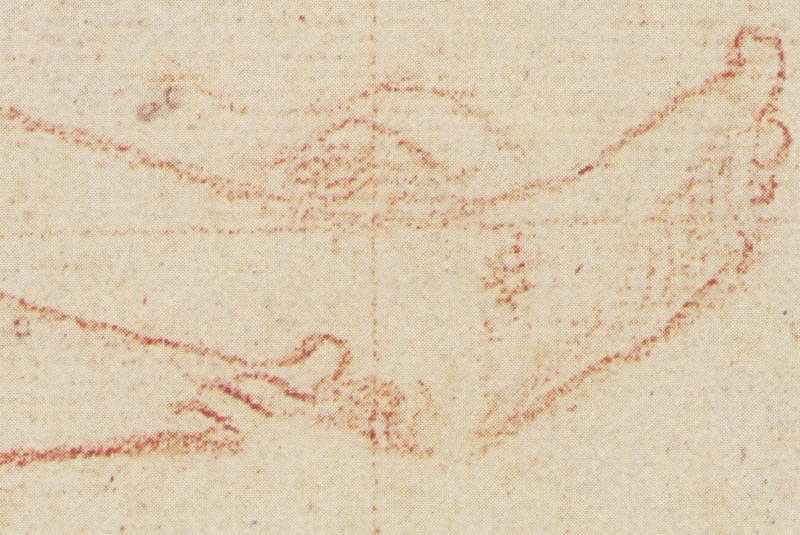 In French toes are "fingers of the foot", doigts de pied, thus enabling their use as a symbol for the artist's hand. 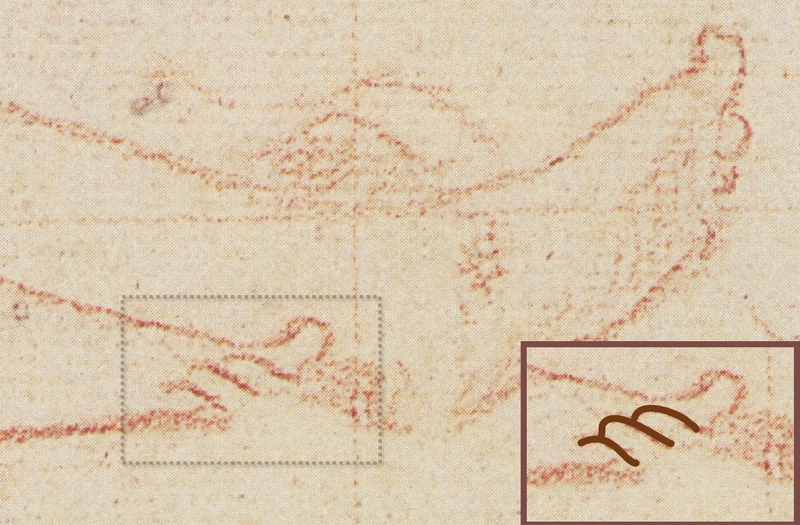 I have shown elsewhere how hands and fingers in art often refer to the painter's own hand. Here, though, Olympia's feet look normal. What, then, do I see that others have not? Her toes spell M for Manet identifying her as an alter ego. Manet formed them so deliberately that she only has four. Now that the self-reference in the study is known, it may be easier to see how Olympia's entire conception is based on Manet looking inwards, not out. She is not a prostitute other than by inference; she is "Manet's androgynous mind" relaxing after conceiving. In the finished picture Olympia's nearest foot wears a satin mule hiding those toes and their significance. Perhaps that's why Manet added the cat just beyond her feet and formed its legs into the letter M instead. For a more complete analysis of the finished Olympia, click here. 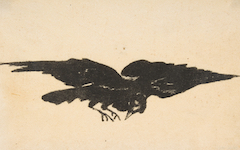 How much meaning can there be in a flying raven? Original Publication Date on EPPH: 09 Jan 2013. © Simon Abrahams. Articles on this site are the copyright of Simon Abrahams. To use copyrighted material in print or other media for purposes beyond 'fair use', you must obtain permission from the copyright owner. Websites may link to this page without permission (please do) but may not reproduce the material on their own site without crediting Simon Abrahams and EPPH.